If you’re a Harry Potter fan, you know one of the most powerful magical objects is the Elder Wand, which was fashioned from the wood of the Sambucus niger shrub, native to the warmer regions of Europe and North America. 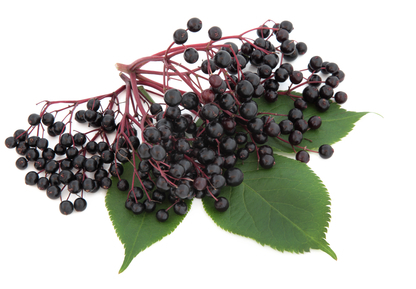 Elderberries may not be magic, but they have long been applied to swelling and wounds, and have more recently been used as a treatment for cold and flu. The delicious purple-black berries are still enjoyed as jams and jellies, and they make a popular form of wine. In the fall, elderberries turn a deep purple, showcasing their high concentrations of antioxidant flavonoids, anthocyanins, and quercetin, all believed to account for the medicinal actions of this plant’s berries and flowers. European herbalists traditionally used elderberry for pain relief and to promote the healing of injuries. They later learned from North American Native peoples that the plant was useful for infections, coughs, and other conditions, too. Additional uses include as a laxative for constipation, stimulating general immune function, chronic fatigue syndrome, allergic rhinitis, and sinusitis. Essentially, if anything from your nose to your throat to your lungs is infected or affected, turn to these berries.